Our rustic wood furniture end tables transform living rooms and enhance rustic décor themes! 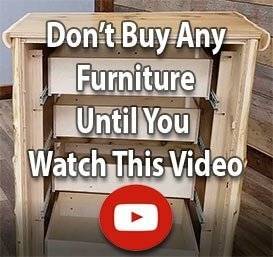 You can quickly enhance any rustic country décor with a barnwood furniture end table with primitive furniture features from Log Furniture Place. Or, use an aspen furniture corner table to complete a cabin décor look. From options in smooth-planed cedar to rough-hewn reclaimed wood furniture and iron-accented western furniture, we have rustic end tables and side tables that are sure to suit you! Log Furniture Places’s occasional tables are a stunning compliment to our full line of sofa and coffee tables! The handcrafted wood furniture our craftsmen build is beautiful and functional. Our log end tables, aspen side tables and teak occasional tables serve as stunning compliments to our full line of sofa and coffee tables to make creating a rustic look easy. The same fine details you see across our full-range of lodge and dining room furniture can be seen in our end tables with Braided iron, open log work, antler accents and more! Whether your look leans heavily toward cabin or Western, our end tables offer you just the right touch of rustic charm. Need extra storage space? Look for rustic end tables with shelving, drawers and doors! When you have a space to fill and a need for storage space, look for log furniture corner tables, end tables, and occasional tables with shelving, drawers and doors built right in. Prefer a wild western décor look? Or rustic log furniture in traditional finishes? You’ll find lots to choose from at Log Furniture Place with our exceptional cabin, lodge and log cabin furniture.